My wife and I have a goal to use passive or side income streams to eventually cover 100% of our expenses. Within the next 10 years, we would like to have enough money coming in every month to cover all our expenses. Based on our currently spending, that is around $5,000 per month we plan to cover. One of the income streams that will help cover some of our expenses is a dividend stock portfolio. This portfolio of stocks consists of 35+ publicly traded companies and is part of our long term financial independence (FI) plan. This year alone (2018) we are expecting to earn close to $6,700 of dividend income. That would cover approximately 11.7% of our current spending. Not a bad start, but still a ways to go. Based on our current dividend growth calculations for the stocks we own, we anticipate earning $14,000 annually in dividends within the next decade. If our spending is still $5,000 per month in 10 years … that would cover 23.3% of our bills. That is actually a very conservative estimate and doesn’t include any new money invested. We are only factoring in dividend reimbursement and company increases in these estimates. Now on to our latest monthly dividend income results. Here is a breakdown of how we earned over $800 last month in dividends … which is getting really close to cover our monthly mortgage payment! Overall, we had 19 stocks pay out a dividend in September, along with our single bond fund. Just like every other month, we earned dividend income in both our taxable and tax deferred accounts. Awesome dividend paying companies like Emerson Electric, Norfolk Southern, and even Microsoft gave my family a raise just for simply owning shares in their company. Here is the breakdown of dividend income (by stock) in September from our taxable accounts. These include stocks held in our Robinhood, Fidelity, and Computershare accounts that will be reported as income earned in 2018. Here is the breakdown of dividend income (by stock) in September from our tax deferred accounts. This includes a Rollover IRA we recently built out from several past employer retirement accounts. At the end of every month, I track and update our future dividend income growth. Reporting our current monthly dividend income is nice, but projecting our future dividend income is way more fun. The result is the amount of income we could expect to earn over the next 12 months … if we walked away today and never touched our portfolio again. Let’s take a look at how we grew our dividend income in September from these 3 different methods. We have switched focus a bit in the second half of 2018. Instead of investing all our money into dividend stocks … we are trying to build up our pre-tax accounts. This allows us to fully optimize our taxes for 2018 and keep more of our money. We did manage to invest a little sum of money in September and even sold a bit of our portfolio off to purchase other assets. One big set of transactions that we made involved my Roth IRA. I held over 40 shares of Kroger (KR) in this account along with a bunch of cash. In order to simplify our investments a little … I sold off our KR shares and used the funds plus the additional cash to buy shares of FSTVX. I really wanted to make things easier with my Roth IRA account. Plus … selling the Kroger shares didn’t trigger any kind of taxable event. The net result of these transactions was $1,973.98 of new money invested and an increase of $37.50 in future income. One last item to cover … we currently hold shares of TGT and LOW in a taxable CapitalOne account. These assets will be moved to E*TRADE later this year. In order to prepare for the move … CapitalOne sold off all partial shares of stock. The net result of this taxable event was a loss of ($2.65) in future income. The good news is the capital gains earned on these partial shares won’t cause much of a stir on our taxes. And the extra cash will soon be invested again. Once our shares are moved to E*TRADE, we plan to consolidate them into our Robinhood account. We have a goal to invest $10,000 to $12,000 of new money in 2018 in our dividend stock accounts. So far, we have invested $8,213.09 in our accounts for 2018. Note – Dividends earned from stocks we own in our Robinhhood account were not directly reinvested through DRiP. Any dividend income earned throughout a given month from Robinhood will eventually be reinvested at some point. Getting a raise from companies we own shares in, is the best way to grow our passive income … in my opinion. These raises come in the form of annual dividend increases and September was a really (really) good month. Overall, 5 companies in our dividend income portfolio announced annual increases. Some of these increases were huge and will allow our dividend income to grow exponentially … without any work from me or my family. It is because of these company increases that our dividend income stream will continue to grow every year … even if we never invest another penny. We started the new year (2018) with a future annual dividend income total under $6,000. In 9 months, we have grown our future dividend income by well over $1,300+ to $7,311.89! I would like to see our future income grow by a couple hundred dollars more by the end of the year. For more information about the rule of 72, check out this post – How to Double Your Dividend Income. Basically, it is a calculation that shows how often your investments will double. Based on the rule of 72, I can quickly calculate how our dividend income could grow (and double) based on our future annual dividend income number of $7,311.89 … that would be earned on October 1, 2019. Our updated figures tell us we should be earning close to $58,500 per year in dividend income by 2046. 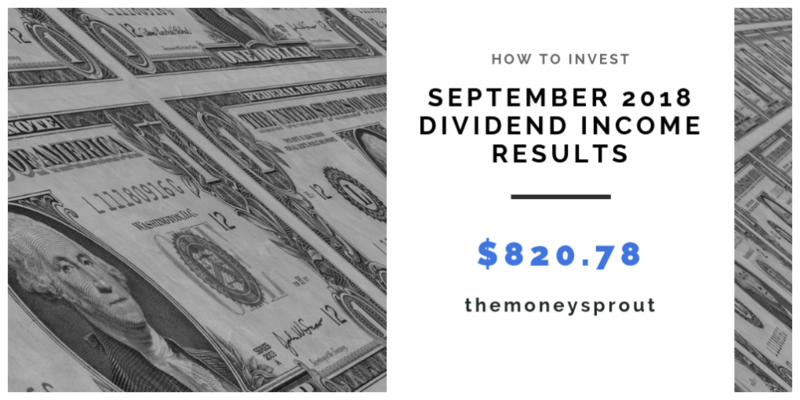 In September, we earned $820.78 of dividend income from our tax differed and regular brokerage accounts. This is a new all-time high for our dividend income earnings! We expect to soon break this record when December comes around … so be sure to check back in then. The long term goals we have set from this dividend income portfolio is to cover at least half of our monthly expenses … which right now would be around ~$2,500 (our monthly spending is currently just under $5,000). Our family would have a lot more flexibility knowing half of our monthly expenses could be covered by our passive dividend income stream. A shorter term goal for 2018 that we set … is to earn $6,700 in dividend income from all our accounts. After 9 months, we are still slightly behind the pace we need to be at to hit our goal. For the first 9 months of the year, we have earned $4,740.64 in dividend income in 2018 (January to September). In order to hit our annual goal, we will need to earn $1,960.50 in additional dividends over the next 3 months. That is an average of $653.50 per month. The month of December should bring in about half of what we need in order to hit our target. There is a slight chance we see our first $1,000+ dividend income month … but we shall see. 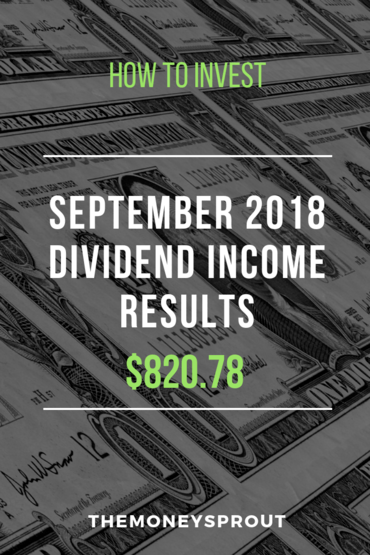 In addition to posting solid September dividend income results, we also managed to raise our annual forward dividend income by an amazing $129 to $7,311.89. This is basically the dividend income we would expect to earn starting today over the next 12 months … without doing anything. I look forward to a strong remaining 3 months of dividend income for 2018. How was your dividend income in September? Are you actively investing and growing your portfolio or maybe waiting for a market correction? Full Disclosure – At the time of this writing, we owned shares in the following stocks and funds noted in this post – September ADM, AFL, AMGN, ED, EMR, INTC, IR, JNJ, KR, LMT, MCD, MSFT, NSC, O, QCOM, TGT, UL, VZ, WMT, XOM, and FSITX. The material above is not a recommendation to buy. Please do your own research on a company before deciding to invest.